Hi All ~ As of this past weekend, I am *finally* feeling like myself again and capable of more than just napping…. hallelujah! Blooming with the spring and so glad of it. For those wondering, I’m taking NP Thyroid by Acella. It’s a dessicated thyroid prescription and I’m feeling great with it. I’m on a course of steroids at the moment because my voice is still MIA and I have a speech coming up. My doctor believes the issue is residual inflammation and perfectly natural considering my thyroid was the biggest and funkiest he’s seen in the U.S. over the course of his career. I can talk, just not very loudly. Hopefully, that part of me will be a bit stronger by the end of the week. Items of note – I’m loving Instagram…. I joined in a fit of frustration at feeling trapped in/by my body and am SO glad I did. I look at the pictures of everyone who’s joined me there and it’s just awesome to get a glimpse into your lives and eyes! You can find my pictures here. Shop update later this week, hopefully tomorrow…. feathers, stone, and sterling, along with some super vintage finds and a few more incredible treasures from my jewelry box. Charlie is eight years old! So glad you are feeling better! Finally! Happy Birthday Charlie. 8 incredible years of love. Glad to hear you are feeling better Shreve. I’m thinking another book by you in the future, yes? But no pressure. :) It’s just that you are a great writer!!! I know you’re not a professional voice user per se, but having two functioning vocal cords also makes swallowing and lifting things much easier. MJ ~ we’re taking that step next, if need be. Because of distance and cost, it made sense to try steroids first. D ~ Something is slowly emerging on that front! It feels good to want to tackle a book again. Thanks for your sweet words, I am stupidly insecure about my writing! Happy Birthday, Charlie! Still a Prince and a Clown! Shreve, be proactive about everything on your body! No one Values it like you do! Just sayin’! Happy Birthday, Charlie!! Shreve, glad you are on the mend and feeling like yourself again. Glad to hear of your continuing recovery. And many happy returns to the Birthday ‘Yote! You are a wonderful writer Shreve and any book you offer us would be a best seller, I’m sure. So glad to hear you’re starting to feel better and more energized! Good luck with the vocal chords. If you have to whisper your speech, so be it – let a microphone carry the load, not your tender/stiff vocal chords. And a big Happy Birthday to Charlie!! I can’t believe he’s eight years old – where has the time gone? Hugs and blessings to you and all the Farmily! And continued healing everyday in every way, Shreve! Happy Birthday Charlie…..so glad you are feeling like your old self Shreve. It always take awhile to come back from surgery, and let the medication do what it is supposed to do…keep healing, good luck with your speech. Yay for Charlie! Happy birthday to my favorite coyote! Shreve, be well! May you feel stronger and stronger. Happiest Hoppiest birthday to Charlie! Shreve your b’day is soon or it has past. Everyday will get better and better. YAY! And another book? wow, your writing is wonderful and i can’t wait!! Never commented before, but have been been receiving Daily Coyote for several years. Hope you healing continues, Shreve! I, too enjoy your writing. HBD Charlie! Loved his baby pics last week. My Oliver is the same age as Charlie; I’ll always know my dog’s age. So glad you’re recovering well & have found a drug that works for you. Keeping good thoughts for you, the farmily, and your continued healing. 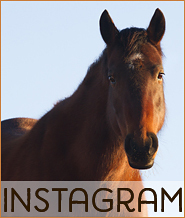 Love Instagram & your account. Instagram is a wonderful mashup of Twitter & Tumblr; you can post a pic and add words (or not); the pictures often speak for themselves. Yours certainly do. Thanks for sharing your amazing life & connections with the world. It’s great that you are feeling much better, so glad to hear that. You are fortunate that they were able to excise that awful thyroid. You will be “fit as a fiddle” soon. I don’t think anything can keep you down for very long. Best wishes to you. I am so glad to hear that you are gaining your momentum again! I too am ready for that next book of yours :) Happy birthday to the most handsome coyote ever. I have been on Instagram for quite some time and love looking through everyone’s pictures, however, I had a few pictures on there that have disappeared, not sure why! Time for new ones! Such Good News! Kick up those cowgirl heels and let out a teeny “yahoooo.” (Knew you would!) Happy blooming spring to you and the farmily kids. I am so glad you are feeling better and I think your voice will return soon. HAPPY BIRTHDAY TO CHARLIE! My cat, Annabella Pearl turned 8 in April also. I find your writing to be quite good. Most writers, I think, are insecure about their writing. To some extent it is a little like stage fright for an actor—you need a little anxiety to pump up the creativity or so it seems! It just seems like yesterday that Charlie was a little pup. Thanks for all the wonderful pictures and words over the years. May there be many more. Happy 8th birthday Charlie! I <3 you! Glad you are on the mend Shreve. Here's to a continuing and speedy recovery. Yay for feeling better Shreve! I cannot BELIEVE that Charlie is already 8!!!! If I remember correctly yours isn’t far behind. Happy Spring! Good to see you are definitely finding the way back. That was one tough road for you. And Happy Birthday Charlie. I cannot believe I’ve been following for 8 years now. He will likely outlive any of the wild coyotes out there, being under your care and protection. Go Charlie. fight on, girl! I too hope you may follow up with a doc for those vocal cord issues. 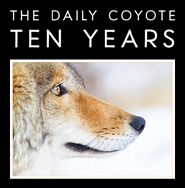 what is the life span of coyotes? on par with maybe a german shepherd-type? Did they check to make sure one of the nerves to your vocal chords wasn’t paralyzed? I had neuro surgery where they went in through the front of my neck (same as thyroid) and one of me nerves was damaged. My left vocal chord was permanently paralyzed and my voice didn’t come back for over a year. Eventually the other vocal chord grew over to meet the paralyzed one, but the damage is still permanent. Just something to think of! Let you know you are in my prayers, I didnt know of your illness till now. I am so glad you are better and back with the fold. I love the pictures of baby chicks, and new calf! Thanks so much. I will need more antler chews for my 6 dogs when you are up to it! Love, and Blessings, NancyMorgan.